The Seal Island trip takes you to a small rocky island 6km west of St Ives and this is the largest island in The Carracks, a group of small rocky inshore islands 200m offshore. It does not take a wildlife expert to understand why the island gets its name as it’s the home to a colony of Grey Atlantic seals. As you walk around St Ives harbour you will often be offered a boat trip and most offer the same packages, all that differs is the departure time and boat details like size or covered area. The boat trips operate throughout the season in good weather and it depends on the tides as to where you depart, when we travelled the tide was on it’s way out and we departed from the main harbour wall and on return were ferried by a small boat back to the harbour. 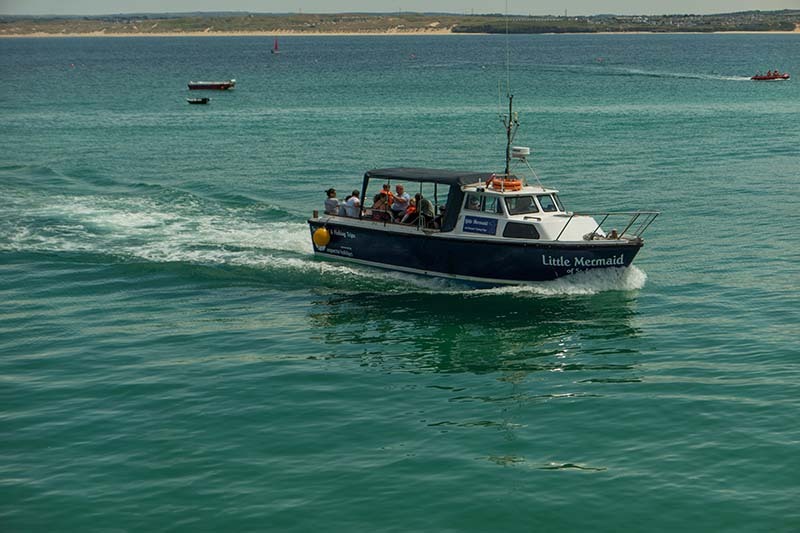 The boat trip takes just over an hour and you get to see some great scenery on the trip, from the St Ives sandy beaches of Porthgwidden and Porthmeor to the stunning coastal cliffs. Of the overall trip, we probably spent just over 10 minutes close-up to the seals at the actual island which is plenty of time to get some great photos as the seals are not at all alarmed by the visiting boats. One word of caution is that you should be prepared to get a little wet from the spray. Although on our trip we just saw the grey seals it can happen that you get to see Common and Bottlenose Dolphins and if you are very lucky the odd Basking Shark. Check our Coast Radar video below that shows footage of the seals, sorry for the shaking but the boat does go up and down a lot. I have also tried to show the view of the main St Ives beaches on the return to the harbour. As well as the popular Seal Island trip many of the boat companies also offer trips to Godrevy Lighthouse, dolphin watching as well as fishing trips and private charter. For those of you that are divers, in 1916, the Enrico Parodi, a 103 m long (339 foot), 3,818-ton steel vessel, struck Gurnard’s Head during thick fog and whilst it was being towed, it sank off The Carracks and its remains are a popular diving attraction. For more information on St Ives check and the area out our Penwith Peninsula pages. All the trip companies have a disclaimer saying they “can’t promise a seal sighting” but from our experience, we think you’d have to be very unlucky not to spot any. If you have a powerful set of binoculars you could take the coast path ramble from St Ives and view from the cliffs. Previous Previous post: Where is the nearest beach to Birmingham?